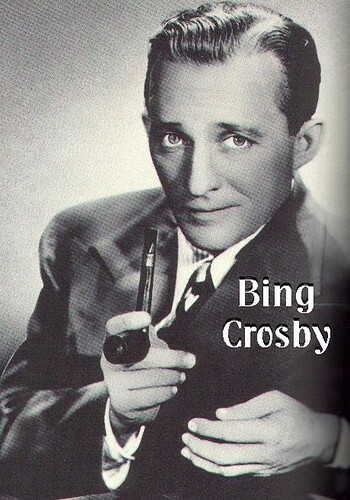 HAPPY BIRTHDAY BING CROSBY ! b. 1112 North "J" Street, Tacoma, WA, USA. 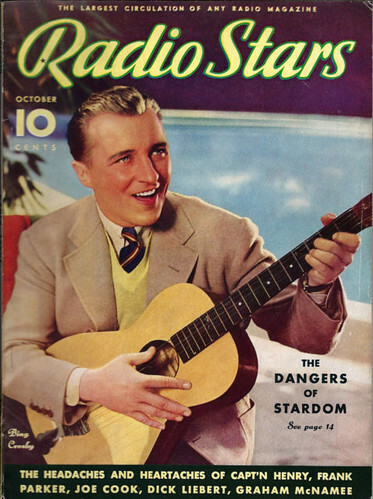 Bing Crosby was, without doubt, the most popular and influential media star of the first half of the 20th century. The undisputed best-selling artist until well into the rock era (with over half a billion records in circulation), the most popular radio star of all time, and the biggest box-office draw of the 1940s, Crosby dominated the entertainment world from the Depression until the mid-'50s, and proved just as influential as he was popular. Unlike the many vocal artists before him, Crosby grew up with radio, and his intimate bedside manner was a style perfectly suited to emphasize the strengths of a medium transmitted directly into the home. He was also helped by the emerging microphone technology: scientists had perfected the electrically amplified recording process scant months before Crosby debuted on record, and in contrast to earlier vocalists, who were forced to strain their voices into the upper register to make an impression on mechanically recorded tracks, Crosby's warm, manly baritone crooned contentedly without a thought of excess. Not to be forgotten in charting Bing Crosby's influence is the music itself. His song knowledge and sense of laid-back swing was learned from early jazz music, far less formal than the European-influenced classical and popular music used for inspiration by the vocalists of the 1910s and '20s. Jazz was by no means his main concentration, though, especially after the 1930s; Crosby instead blended contemporary pop hits with the best songs from a wide range of material (occasionally recording theme-oriented songs written by non-specialists as well, such as Cole Porter's notoriously un-Western "Don't Fence Me In"). His wide repertoire covered show tunes, film music, country & western songs, patriotic standards, religious hymns, holiday favorites, and ethnic ballads (most notably Irish and Hawaiian). The breadth of material wasn't threatening to audiences because Crosby put his own indelible stamp on each song he recorded, appealing to many different audiences while still not endangering his own fan base. Bing Crosby was among the first to actually read songs, making them his own by interpreting the lyrics and emphasizing words or phrases to emphasize what he thought best. His influence and importance in terms of vocal ability and knowledge of American popular music are immense, but what made Bing Crosby more than anything else was his persona -- whether it was an artificial creation or something utterly natural to his own personality. Crosby represented the American everyman -- strong and stern to a point yet easygoing and affable, tolerant of other viewpoints but quick to defend God and the American way -- during the hard times of the Depression and World War II, when Americans most needed a symbol of what their country was all about. 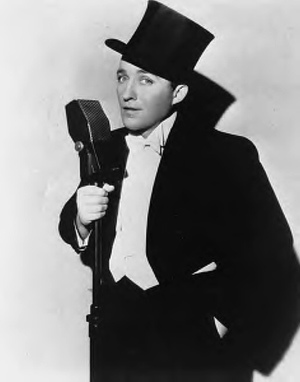 Bing Crosby was born Harry Lillis Crosby in Tacoma, WA, on May 3, 1903. (Bingo was a childhood nickname from one of his favorite comic strips.) The fourth of seven children in a poverty-level family who loved to sing, he was briefly sent to vocal lessons early on by his mother, until he grew tired of the training. An early admirer of Al Jolson, Crosby saw his hero perform in 1917. Crosby sang in a high-school jazz band, and when he began attending nearby Gonzaga College (he had grown up practically in the middle of the campus), he ordered a drum set through the mail and practiced on the set. Introduced to a local bandleader named Al Rinker, he was invited to join Rinker's group, the Musicaladers, singing and playing drums with the group throughout college. Though the Musicaladers broke up soon after his graduation in 1925, Bing Crosby was ready to stick with the music business. Crosby had made quite a bit of money during the band's career, and he and Rinker -- who was the brother of Mildred Bailey -- were confident they could make it in California. 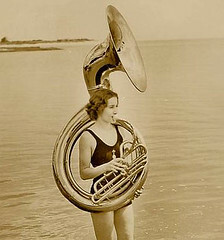 They packed up their belongings and headed out for Los Angeles, finding good money working in vaudeville until they were hired by Paul Whiteman, leader of the most popular jazz band in the country (and known as the "King of Jazz" in an era when black pioneers were mostly ignored since they were unmarketable). For a few songs during Whiteman's shows, Rinker and Crosby sang as the Rhythm Boys with Harry Barris (a pianist, arranger, vocal effects artist, and songwriter later renowned for "I Surrender Dear" and "Wrap Your Troubles in Dreams"). With their clever songwriting and stage routines, the trio soon became one of the Paul Whiteman Orchestra's most popular attractions, and Crosby took a vocal on one of Whiteman's biggest hits of 1927-1928, "Ol' Man River." Besides appearing on record with Whiteman's orchestra, the Rhythm Boys also recorded on their own, though an opportunity for Crosby to enlarge his part in the 1930 film King of Jazz with a solo song went unrealized, as he sat in the clink for a drunk-driving altercation. When Whiteman again hit the road in 1930, the Rhythm Boys stayed behind on the West Coast. After Crosby hired his big brother Everett as a manager, he began recording consistently as a solo act with Brunswick Records in early 1931, and by year's end had chalked up several of the year's biggest hits, including "Out of Nowhere," "Just One More Chance," "I Found a Million-Dollar Baby," and "At Your Command." He appeared in three films that year, and in September began a popular CBS radio series. Its success was similarly unprecedented; in less than a year, the show was among the nation's most popular and earned Crosby a starring role in 1932's The Big Broadcast, which brought radio stars like Burns & Allen to the screen. By the midpoint of the decade, Crosby was among the top ten most popular film stars. His musical success had, if anything, gained momentum during the same time, producing some of the biggest hits of 1932-1934: "Please," "Brother, Can You Spare a Dime?," "You're Getting to Be a Habit With Me," "Little Dutch Mill," "Love in Bloom," and "June in January." "June in January," itself the biggest hit at that point in Crosby's young career, signaled a turn in his career. Brunswick executive Jack Kapp had just struck out on his own with an American subsidiary of the British Decca Records, and Crosby was lured over with the promise of higher royalty rates. Though his initial releases on Decca were recordings from his films of the year -- "June in January" was taken from Here Is My Heart -- Crosby began stretching out with religious material (such as "Silent Night, Holy Night," which became one of his biggest sellers, estimated at up to ten million). 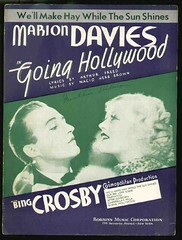 After the biggest hit of 1936, Bing Crosby followed up with -- what else? -- the biggest of 1937, just months later. "Sweet Leilani," from the similarly Hawaiian film Waikiki Wedding, showed Bing the direction his career could take over the course of the 1940s and '50s. 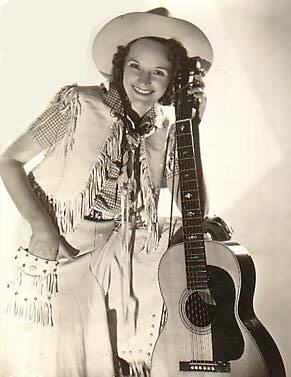 Though he had recorded several cowboy songs earlier in the 1930s as well as the occasional song of inspiration, Crosby began covering everything under the sun, the popular hits of every genre of contemporary music. These weren't castoffs, either; many of his 1940s country & western covers were hits, such as "New San Antonio Rose," "You Are My Sunshine," "Deep in the Heart of Texas," "Pistol-Packin' Mama," "San Fernando Valley," and "Chattanoogie Shoe Shine Boy." 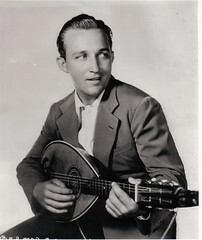 With the advent of American involvement in World War II, Bing Crosby entered the peak of his career. Arriving in 1940 was the first of his popular "Road" movies with old friend Bob Hope and Dorothy Lamour, along with three of the biggest hits of the year ("Sierra Sue," "Trade Winds," "Only Forever"). 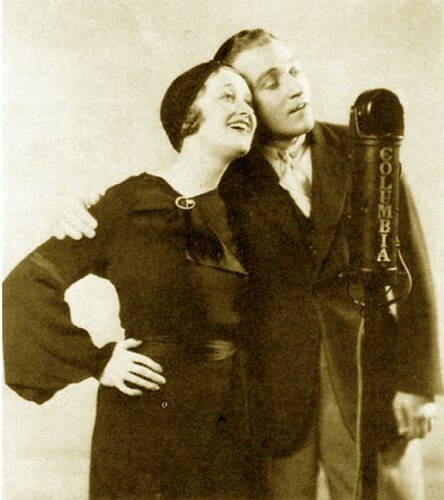 Crosby and Hope had first met in 1932, when the two both performed at the Capitol Theater in New York. They reunited later in the '30s to open a racetrack, and after reprising some old vaudeville routines, a Paramount Pictures producer decided to find a vehicle for the pair and came up with The Road to Singapore. More popular success followed in 1941 with the introduction of the biggest hit of Papa Bing's career, "White Christmas." 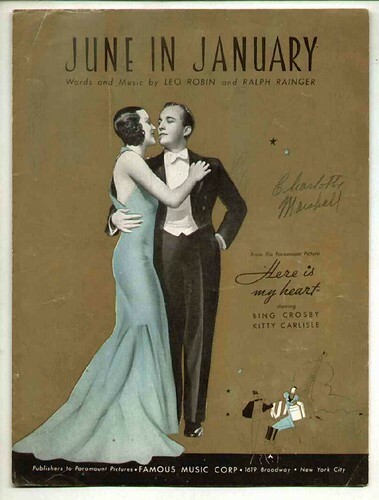 Written by Irving Berlin for 1942's Holiday Inn (a film that featured a Berlin song for each major holiday of the year), the single was debuted on Bing's radio show on Christmas Day, 1941. Recorded the following May and released in October, "White Christmas" stayed at number one for the rest of 1942. Reissued near Christmas for each of the next 20 years, it became the best-selling single of all time, with totals of over 30 million copies. It was a favorite for soldiers on the various USO tours Crosby attended during the war years, as was another holiday song, "I'll Be Home for Christmas." 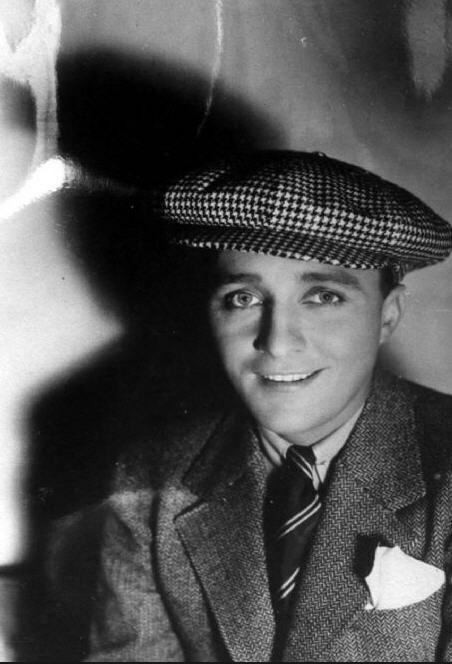 Crosby's popular success continued after the end of the war, and he remained the top box-office draw until 1948 (his fifth consecutive year at number one). As with all the jazz-oriented stars of the first half of the 20th century, Crosby's chart popularity was obviously affected by the rise of rock & roll in the mid-'50s. Though 1948's "Now Is the Hour" proved his last number one hit, the lack of chart success proved to be a boon: Crosby now had the time to concentrate on album-oriented projects and collaborations with other vocalists and name bands, definitely a more enjoyable venture than singing pop hits of the day on his radio show, ad nauseam. Inspired by the '50s adult-oriented album concepts of Frank Sinatra (who had no doubt been inspired by Bing in no small way), Crosby began to record his most well-received records in ages, as Bing Sings Whilst Bregman Swings (1956) and Bing With a Beat (1957) returned him to the hot jazz he had loved and performed back in the 1930s. His recording and film schedule began to slow in the 1960s, though he recorded several LPs for United Artists during the mid-'70s (one with Fred Astaire) and returned to active performance during 1976-1977. While golfing in Spain on October 14, 1977, Bing Crosby collapsed and died of a heart attack. Part of the team of Comden And Green - One of the real treasures of the musical stage. The songwriting and screenwriting duo of Betty Comden and Adolph Green created some of the most enduring and beloved musical comedies of the post-war era, reaching their apex with 1952's Singin' in the Rain, widely acclaimed as the greatest film musical ever made. Comden was born Elizabeth Basya Comden on May 3, 1919, in New York City, studying science before pursuing a career in acting; during the late '30s, she befriended Green, himself an aspiring actor as well, and together they formed the Revuers with pal Judy Tuvim. Financial limitations forced the trio to compose their own material and together, Comden and Green became increasingly adept at writing lyrics and librettos; their friend Leonard Bernstein was sufficiently impressed enough to invite the duo to work on his musical adaptation of the Jerome Robbins ballet Fancy Free, retitled On the Town. 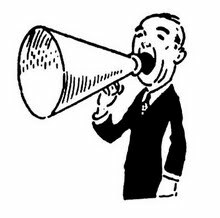 The musical premiered on Broadway in 1944 and was an immediate smash; Comden and Green next collaborated with composer Morton Gould on 1945's Million Dollar Baby before heeding the call of Hollywood for the 1947 screen musical Good News. 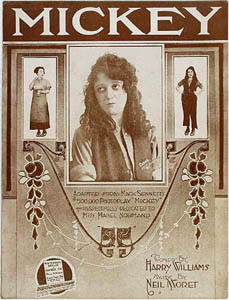 Both The Barkleys of Broadway and Take Me Out to the Ball Game debuted two years later, along with the film adaptation of On the Town; ironically, Singin' in the Rain was not a box-office success at the time of its original release, but is now the gold standard by which movie musicals are judged. After completing work on another film masterpiece, 1953's The Band Wagon, Comden and Green returned their focus to Broadway, reuniting with Bernstein for Wonderful Town; an extended collaboration with Jule Styne yielded a series of hits, including Two on the Aisle, Peter Pan, Hallelujah, Baby!, and Bells Are Ringing, the latter featuring fellow Revuers alum Tuvim (or, as she was now much better known, Judy Holliday). 1955's It's Always Fair Weather closed out the duo's long run at MGM and they moved to Warner Bros. for 1958's Auntie Mame, concurrently co-starring in their own two-person stage show. 1964's satirical What a Way to Go was their final screen collaboration and in the decades to follow, their stage projects appeared less frequently as well, although 1970's Applause and 1978's On the Twentieth Century recaptured the glories of their past. With 1991's The Will Rogers Follies, Comden and Green returned to their rightful prominence, earning a Tony Award for their efforts; that same year, they were also announced as recipients of the annual Kennedy Center Honors. 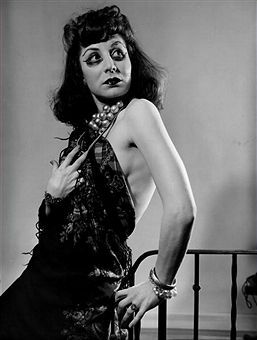 Additionally, she is a member of the Songwriters Hall of Fame and the Theatre Hall of Fame and in 1995, Comden published her autobiography Off Stage. An exciting Dixieland trumpeter with an appealing tone and strong melodic ideas, Yank Lawson was a popular attraction on the Dixieland scene for decades. He was with Ben Pollack's band during 1933-1935 and when it broke up, he was one of the many sidemen who became founding members of the Bob Crosby Orchestra. Lawson was featured on many records, both with the big band and Bob Crosby's Bobcats, during 1935-1938. He was with Tommy Dorsey during 1938-1939 and had plenty of solo space with Dorsey's Clambake Seven. After a period back with Crosby (1941-1942) and with Benny Goodman (1942), Lawson became a studio musician and started leading his own Dixieland sessions. He recorded extensively with Bob Haggart in the Lawson-Haggart band during the 1950s, had reunions with Crosby, played the musical part of King Oliver on Louis Armstrong's A Musical Autobiography, and had sessions with Eddie Condon, playing at Condon's club regularly during 1964-1966. In 1968, he and Haggart put together the World's Greatest Jazz Band, an all-star Dixieland group that was together for ten years. He continued playing with Haggart and other top Dixieland players at festivals and jazz parties up until his death at age 83. Yank Lawson recorded as a leader through the years for Bob Thiele's various labels (including Signature), Decca, Everest, ABC-Paramount, Project 3, Atlantic, World Jazz Records, Audiophile, and Jazzology. Member group: "Louise Massey & the Westerners". Where is the rose that grows in repose like you? There in the morning dew. Dearie to change your name to mine? There’s a bit of Killarney, bit of Blarney, too. Can you blame anyone for falling in love with you? And he believed it too. When it rained five days, sky turned dark at night. And trouble takin' place, in the lowlands that night. I woke up this morning, couldn't even get out of my door. There's so much of trouble, make a poor man wonder where he wants to go. They rowed a little boat, about five miles closed of home. I packed up all my things throwed 'em in, and they rowed me along. Well it thunders and lightened, the wind begin to blow. Thunders and lightened, the wind begin to blow. And thousands of people, ain't got no place to go. I when upon some high, some high, high lonesome hill. And looked down on the house where I used to live. Back-water blues done caused me to pack my things and go. Cause my house fell down and I can't live there no mo'. Mmmmmm, I can't move no more. Ohhhhhhhh, I can't move no more. There's no place for a poor, poor man to go.